There isn’t a week that goes by without news of another tragedy due to bullying. Children are being traumatized at best and taking their lives at worst due to the cruelty of their peers. This problem has grown in epidemic proportions and will continue to do so without early intervention by parents, organizations and schools. “We have a continuing responsibility to our families and the community to instill an understanding in our students of the impact of our words and actions on others,” said K–8 Principal Dr. Susie Wolbe. “We brought in ‘Challenge Day’ for our entire middle school long before it appeared on Oprah, we brought in ‘Rachel’s Challenge’ for our entire K–8 and now ‘The Power of One,’ again for our entire K-8. We do not bring in these groups and then forget about them; we keep a piece of each program and use them all to make an impression, along with our Ethical Covenant, on our students regarding our responsibility to our world.” Students at Levine Academy continue to have weekly Be the Change club meetings, and now they will have an opportunity to join an anti-bullying club, established by two lower-school students. “We will never be perfect but we will always give attention to the greater goal of being kind, supportive and respectful to one another.” Wolbe said. The Ann and Nate Levine Academy, a Conservative Jewish day school, is located at 18011 Hillcrest Road in Far North Dallas. “We often said how fast our lives were going. The days and years flew by. And yet we remembered and treasured all the wonderful experiences we shared. “We were truly inseparable. For almost 56 years. We went to work together each day, lunched together, shared everything, and except for his Tuesday night poker game and my Thursdays with ‘the girls’ we literally spent every moment with each other. “We loved our work at the Texas Jewish Post. It was never a drudge or a chore, but truly a labor of love, and we relished each weekly issue and all the myriad of little tasks that accompanied it. “How lucky I was that evening at the Jewish Welfare Board when fate brought Jimmy Wisch to the USO club on Beacon Street. “Our first apartment was on West Broadway, across from Temple Beth-El’s former address. We were excited that we were able to find a furnished apartment with a private bath. They were hard to find in those days when the servicemen were coming home from the Armed Forces. We thought it was ‘our blue heaven’ despite being on the top floor of an old building with no air conditioning, paper draperies, a leaky roof and old beat-up furniture. To get relief from the heat, we would put a bowl of ice on our Murphy bed with an oscillating fan to get a bit of cool air. We considered ourselves fortunate to have our own apartment. “Our children, grandchildren and great-grandchildren were his greatest treasures. “God blessed me when Jimmy came into my life. He taught me so much. I truly believe he made me the person I am today. “Though we weren’t ready for his death, God blessed him when he gave him the gift of not having to suffer. Neither of us expected or had any thoughts of the tragedy that came to our family last Shabbat. We also share with you a TJP profile on Rene written in honor of her 86th birthday in August 2008. Sleep sweetly, Mom, next to Dad and in peace. 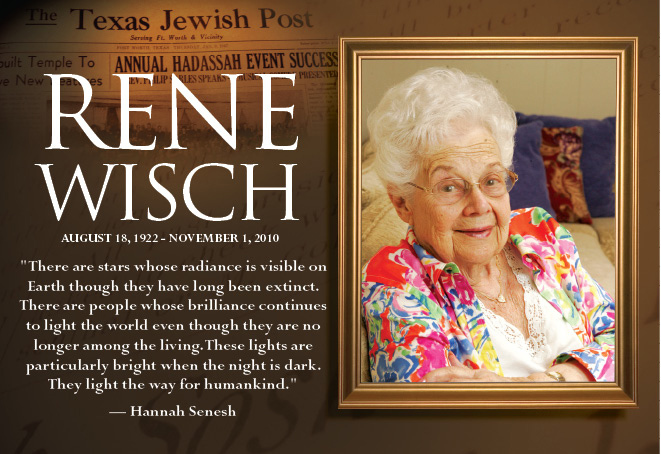 If you ask Rene Wisch, she’ll tell you that she’s loved almost every minute of her action-packed life. Since coming to Fort Worth over 60 years ago, the female half of the duo who published the Texas Jewish Post has done and seen some amazing things. Wisch and her late husband Jimmy took the circulation of the Texas Jewish Post, originally a monthly paper, to a weekly readership of nearly 20,000. Over the course of five decades, they took 10 trips to Israel together, often heading delegations of reporters. In addition to her professional career, Wisch served formally and informally with several local community organizations, and raised five children over the course of three decades. In the beginning, Irene Gladys Radin (dubbed Rene by her future husband) met Jimmy Wisch at the Jewish Welfare Board in Boston during World War II. He was a soldier in the Army, and she was a pretty brunette with sparkling eyes. Jimmy was a prolific writer even back then, and he charmed her away from Boston and her mother. Jimmy’s family was in Fort Worth, and after the war, the newlyweds came southwest, only to face a housing crisis. With the war over and Fort Worth barely beginning to boom, there was no place to stay. Jimmy was working for the Railway Mail Service (an adjunct to the U.S. Postal Service), and Rene had a job with the War Production Board. Together, the two took over the then-monthly Texas Jewish Post in 1947. Wisch referred to the Post as her “first child.” Production on the monthly paper grew to a weekly effort as the two began marketing in earnest. Jimmy covered the national news, while Rene focused on the “Dallas Doings” and “Around the Town.” The social columns were important, both to the paper and to the community. “Names make news,” she says. “Rene truly walks the walk of Jewish values, from tikkun olam to refraining from gossip, and showing kindness to everyone,” Rogers says. Wisch was heavily involved in the national women’s organization Theta Sigma Phi. Formed in 1909 the organization evolved from a collegiate honorary women’s journalism fraternity to become Women in Communications, a strong national network of communicators in a broad range of disciplines. Fellow WIC members Doug Newsom, a professor at TCU, and Bobbie Wygant, Emmy® award-winning entertainment reporter for NBC5, came up through the ranks of the now-defunct Fort Worth chapter with Wisch. Newsom says Wisch served in almost every capacity for the organization, including the presidency and a stint as treasurer. Both Newsom and Wygant single out Wisch’s generosity. Although the group contracted with locations for their business meetings, sometimes they found themselves homeless. Both Wygant and Newsom fondly recall that at those times, and every summer, Wisch opened her Hulen-area home for meetings or a pool party. Carole Rogers also speaks of Wisch’s generosity. Rogers says that many times, JFS approached Wisch for everything from donations to welcoming a lonely person into her home for a holiday celebration. Without fail, Rogers says, Wisch has stepped up to the plate. Tricia Carter Haber can testify to that. Haber says that, when she was new to the area and married into a family that had been in Fort Worth for generations, Wisch would go out of her way at Hadassah meetings or social events to sit with her, and engage her in conversation. Haber, who was doing her best to remember names and who was related to whom, will be grateful for a lifetime. Wisch became an expert at juggling her hostess duties, family commitments and the full-time job of running a weekly newspaper. There was no shortage of hard work, especially in the pre-computer days of linotype, when the paper had to be set and folded by hand. Sometimes she did her work at home, and on more than one occasion, from her hospital room after the birth of a child. She says that the day she brought her second child Steve home from the hospital was also the day that the paper moved to its Fort Worth headquarters. With both parents working on the paper and on constant deadline, Wisch reports that often, the kids had to get used to their unusual schedule. 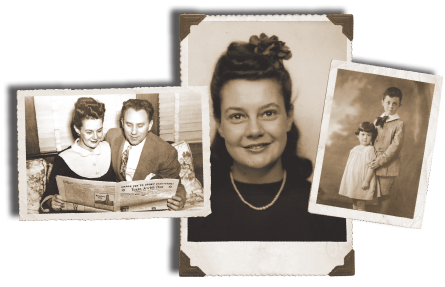 Together, the Wisches raised five children, which is not unusual for a family of the 1950s. What is unusual, especially for a woman of that time, was that Wisch was a full-time working mother and gave birth to her youngest daughter when she was 43. Other people, especially her children, acknowledge that she seemed to be ahead of her time. However, she thinks nothing of it. Tricia Haber says that one of the things she respects most about Wisch is that she served as a role model of what a strong, professional woman could be. “She’s the heart and soul of the TJP,” says Haber. JFS’ Carole Rogers says that Wisch was one of the first working professional women she knew. However, Rogers adds, work and family weren’t separated for Wisch. Bobbie Wygant says that Wisch’s accomplishments in the career and family arena were “remarkable, but not unusual.” Many of the Women in Communications had families, careers and extensive volunteer commitments. “These were tough women,” Wygant says. At almost 86, Wisch still serves as the TJP’s publisher. The “mom and pop paper” she and her husband started over 60 years ago has grown from a staff of two to a three-generation Wisch family enterprise, with a staff of 10 to 12. Wisch is justifiably proud of the paper’s tenure, as well as the TJP’s growth, bucking the national newspaper trends of shrinking readership and staff size. The “family business” survived both the ebb and flow of the newspaper trade, as well as challenges from at least two other news agencies which launched competing papers aimed at the Dallas Jewish market. Those efforts failed, while the TJP continues. “I don’t think there was enough of a market to support two English-language Jewish newspapers in Dallas,” Wisch says, graciously. Carole Rogers also singles Wisch out as a model for growing older gracefully. She says Wisch is not sad or frustrated, but very pragmatic about the changes aging brings. Until recently, the dynamic Wisch commuted from her Fort Worth home to the Dallas office three days a week. She is relocating to be closer to her four Dallas-area children and her grandchildren, and reports she’s looking forward to spending more time in the office. The TJP invites you to share thoughts and memories about Rene below.